Well, it’s a morning of clashes. Death in Toronto, royal life in London and one kid desperately attempting to save his flagging career. It would be remiss and rather alarmist to call it what it looks like until the official term is settled on, but this morning an automobile was the medium of violence as one individual drove it into 25 others on the streets of Toronto. With motives still unknown, what we do know is that the suspect is safely in custody, with vision arriving of the police arresting him at gunpoint. Now, despite the fact that this act had a very Canadian outcome to it (suspect alive, not immediately outing it as ‘terrorism’), her borders are not high enough to shut out the white noise of Internet discourse, with several figures quick to join the sparsest of dots, and draw the longest of bows. Yesterday: Man kills 4 people at Waffle House using a gun. Far-left Parkland activists: Calls for gun confiscation and spread lies. 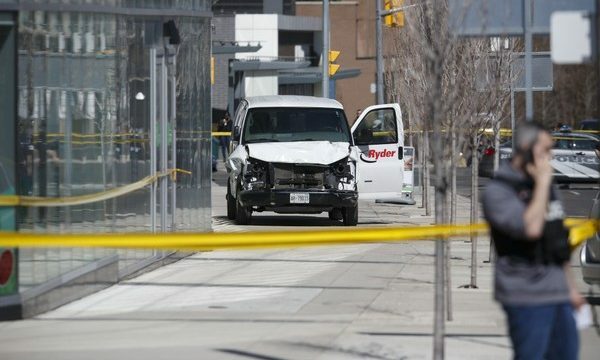 Today: Man kills 9+ people in Toronto using a van. Far-left Parkland activists: Total silence. Authorities confirm it was a terrorist attack. Authorities don’t know motive for the slaughter. Denialism is now the standard response. However, it does seem that one extremely irate Canadian fellow very much asked the nonsense to stop, if you very much could. More on this as it comes to hand. Royal baby saga reaches the third episode, named after a hashtag. Grand exciting news, old bean! It seems that the dying embers of the British Empire have been fanned this morning, wheezing a blur of amber and life as it seems the sun has not yet set. This morning, the Duchess of Cambridge (that Kate woman) passed out the genetic salad that The Duke of Cambridge (mini Charles) seasoned. Crank up the regal joy, and fish the best crockery from the top shelf, for it’s a moment of great celebration and did those feet in ancient time, walk upon England’s mountains green? The baby, imaginatively named the #royalbaby (presumably to be down with the youth), is the fifth in line to the throne. And, look. I get it. Everyone wants to be a princess. Even me. Living a lavish life of pomp, ceremony and excess is a fabulous thing to be chosen for, especially considering the only real prerequisite for the job is your ability to give it up on the first date and spend the rest of your prime breeding under the hypermegawatt heat of clicking cameras. To be fair, it’s not that far removed from a zoo. You’re trundled out to perform timetabled tasks, pose for pictures and retire to the hay to roll in it. However, much like the Western Lowland Gorillas at London Zoo, leaving your enclosure to tour the streets of LDN is an impossibly, as surely the staff with tranquilisers would be deployed to return you back to your room. It’s not a slam on Kate, but the continued existence of the royals seems odd. They serve no purpose, save from being trundled around the country as a fairground attraction. It seems to be an odd life to lead. How does one go from complete independence to utter dependence, as an entire nation plays the pushy aunt, prodding you with leading questions when are you two going to have another baby? The next in line, Prince Charles is the most suitable job, purely on the basis that he’s managed to not die. When he ascends to the throne, it’ll be his face on our currency, and his voice rambling through the seasonal greetings. It’s a curio of yesteryear, something that draws our attention, because they’re so different to us. This curious concept is much the same as an unfortunate Asiatic couple would have endured in the late nineteenth century, as they were paraded around behind bars in circus tents in the name of entertainment. Ooo, look at them exotics. I hope theys mate they do. Yodelling kid hopes to jump shark, pushes conspiracy theorist to drop an album with him. Well, not drop per se, as the theorist doesn’t believe in gravity. No matter. As the prophet Lil’ Kim stated, yo it’s over. Two weeks is a long time in the world of memedom. To be fair to him, the Walmart yodelling kid has lived all of his fifteen minutes to the ragged edge. He’s performed at Coachella, he’s been subject to numerous remixes. However, the yodelling kid doesn’t want to say gooodBBByyyEEEyyEEEyyOOOO, which makes us cry hateful exasperated apathy. This week, he’s attempted to wrangle flat-earth truther Kyrie Irving into a duet. Probably worth mentioning that Irving is paid to play basketball. His desire for trading in his contract to dominate the yodelling scene with a minor is unknown. Bruh, just do a steppy urban remix of your remix with Elton John, and then pack it in. He’s a busy man. The Royals are probably going to book him, probably today.